Backups are divided into physical backups and logical backups. Physical backups, which are the primary concern in a backup and recovery strategy, are copies of physical database files. You can make physical backups with either the Recovery Manager (RMAN) utility or operating system utilities. In contrast, logical backups contain logical data (for example, tables and stored procedures) extracted with the Oracle Export utility and stored in a binary file. You can use logical backups to supplement physical backups. To restore a physical backup of a datafile or control file is to reconstruct it and make it available to the Oracle database server. 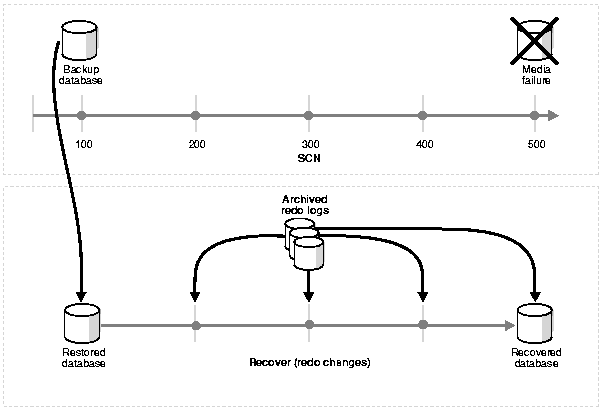 To recover a restored datafile is to update it by applying archived redo logs and online redo logs, that is, records of changes made to the database after the backup was taken. If you use RMAN, then you can also recover restored datafiles with incremental backups, which are backups of a datafile that contain only blocks that changed after a previous incremental backup. After the necessary files are restored, media recovery must be initiated by the user. Media recovery can use both archived redo logs and online redo logs to recover the datafiles. If you use SQL*Plus, then you can run the RECOVER command to perform recovery. If you use RMAN, then you run the RMAN RECOVER command to perform recovery. Unlike media recovery, Oracle performs crash recovery and instance recovery automatically after an instance failure. Crash and instance recovery recover a database to its transaction-consistent state just before instance failure. By definition, crash recovery is the recovery of a database in a single-instance configuration or an Oracle Real Application Clusters configuration in which all instances have crashed. In contrast, instance recovery is the recovery of one failed instance by a live instance in an Oracle Real Application Clusters configuration. Crash and instance recovery involve two distinct operations: rolling forward the current, online datafiles by applying both committed and uncommitted transactions contained in online redo records, and then rolling back changes made in uncommitted transactions to their original state. Crash and instance recovery are automatic.